This Map Drawing gives a complete overview of the JiaYuGuan Fortress UNESCO World Cultural Heritage Site, Scenic Spot, and Recreational Area in JiaYuGuan, in Western Gansu Province of China. 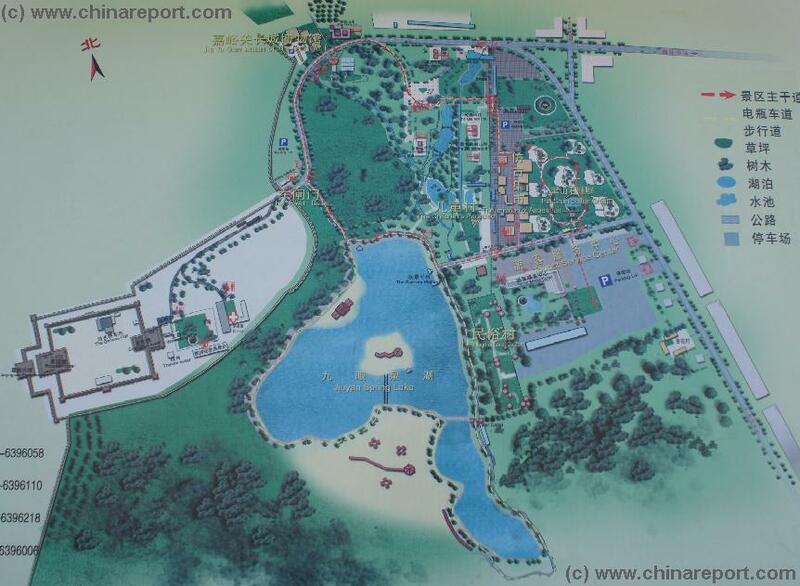 The Map gives a full lay-out of the individual elements of the Ming Dynasty Era Fortress, as well as the nearby Spring Lake Recreational Area, the Arrival and Parking Area, the Chinese Garden named after Architect of the Fortress Hi Shen, The Great Wall of China at JiaYuGuan Pass Historic Museum and other nearby Tourist Facilities of lesser importance. Follow the links to navigate along each individual section of the renowned JiaYuGuan Fortress, and the attached Recreational Area.
! Sign the China Report Guestbook ! The Park dedicated to Hi Shen is located North of the grand boulevard leading up from the arrival area to the tourist information center and the ticket offices. Once inside the Park one can enjoy the view of the Fortress while cooling down near the water of Spring Lake, or head North-West to go immediately to the Fortress along a small road leading up to the Front and Outer Gate. The Great Wall of China at JiaYuGuan Pass Museum is further up North and can be seen in the Distance. Turn Left and West however and one finds oneself within the confines of the Fortress Citadel. Sights to see within area are first of all the Steles Pavilion, which is found along the Road leading up to the Inner Fortress Walls and Gates. Second in Line is Wenchang Ge or the Hall of the Literary Elite opposite of which are some souvenir stores and toilet facilities, then third is the Guan Di Miao, or Temple of Lord Guan, after which follows the Eastern Guanghua Gate of the Inner Fortress. This Vaulted Gate is one of the Legendary Two Gates of the Fortress. After walking inside Central Courtyard of the Inner Fortress one can marvel at the Western Gate or have a walk around on the Inner Fortress Walls to check out the View of the Surrounding Area. On Good days one can clearly make out the snowcaps of the Qilian Shan in the South and the Suspended Arm Great Wall in the North. Last stop on any Tour should be the spectacular Great Wall of China at JiaYuGuan Pass Museum, which is located beyond the Front Gate in the North of the Park Area. A Full Google Earth Supported Map of JiayuGuan AsiaReport.com.